Exterior of the Massachusetts Museum of Contemporary Art during the installation of the unfinished work Training Ground for Democracy by Christoph Büchel, North Adams, 2006. Photo: John Carli. AT FIRST, IT LOOKED LIKE a terrific match. 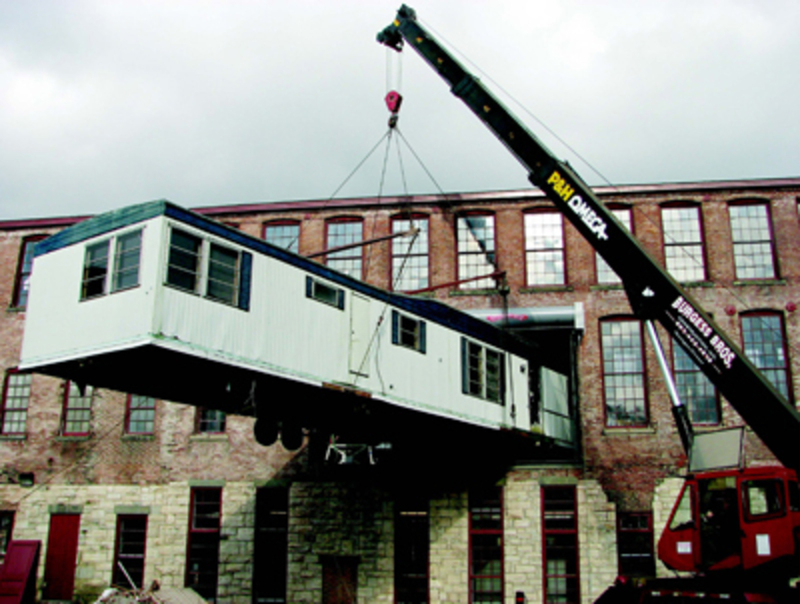 Swiss installation artist Christoph Büchel and Joseph Thompson, director of the Massachusetts Museum of Contemporary Art, had planned great things for Mass MoCA’s vast Building 5, one of the world’s largest exhibition spaces for contemporary art. Büchel had conceived an artwork whose physical scale was in keeping with its imposing subjectloosely speaking, ideological warfare. Thompson was to deliver the tons (approximately 150) of material necessary to realize Büchel’s vision, which included an entire disused cinema, a dive bar, a two-story Cape Cod home, and a reconstruction of one of the mock villages used by the US military to train troops destined for Iraq. Titled Training Ground for Democracy, the installation was first scheduled to open to the public in December 2006.